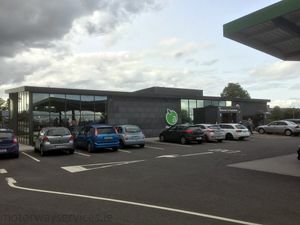 As part of Applegreen's expansion, Paulstown is one of their latest private motorway sites to open. It's a small site sited on the R912. Parking is free for all vehicles for the first two hours only. Further information is not available, please update this if you know. 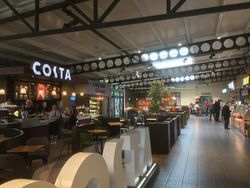 Like most Irish services, the building is a combined dining area and forecourt sales shop, with an entrance for each. One of the entrances is around the side. To help it blend in, the building has grey stone-effect walls on the outside, and wood-effect on the inside. With access roads all around it, the whole site feels slightly small. The shower block is provided in a second building by the lorry parking.